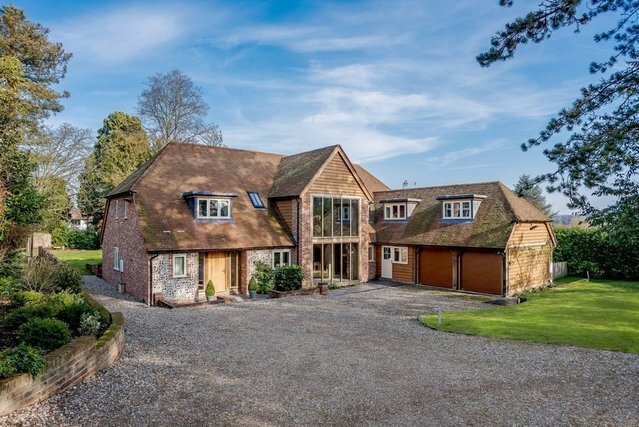 Stunning oak framed family house in picturesque Streatley. Conifers is a superb oak framed family home, built only five years ago by award-winning company, Border Oak (five years NHBC warranty remaining). Border Oak is a highly renowned, thriving family owned company and winner of numerous awards for reviving the ancient art of green oak framing, an English design method that had died out some 250 years ago.Conifers was lovingly designed for modern family living, bringing together the best of old and new. The house combines the beauty of oak framing with the latest in smart home control and convenience. The attractive property features brick and flint and sits in the middle of the well-proportioned grounds. Triple glazed throughout with underfloor heating, Conifers is an efficient modern home with flexible accommodation.The highlight is the large open plan kitchen/dining/living area which occupies the central part of the property and includes bi-fold doors to the garden and a large double vaulted glazed section to the front, which floods the whole house with natural light. There is a bespoke hand-built kitchen by Griggs and Mackay which includes fitted appliances including a Liebherr fridge/freezer, a Leibherr fridge, Bosch dishwasher and Redfyre Aga. Leading from the kitchen is a playroom, which would make a wonderful library. Additionally, there are two further good-sized reception rooms, including the cinema room. A separate utility room leads to an office above the garage, which could be used as separate annexe accommodation if required. There are five generously proportioned bedrooms, including the impressive master suite with double vaulted ceiling and far reaching views.Technology: the comprehensive home automation and entertainment system brings together scenelighting, security feeds and ultra high definition video and audio to the main rooms. Everything from the 5.1 surround sound cinema, gaming room, gate camera and ceiling music, is easy to control from your 'phone or any of the remote controls. The 14 independently controlled underfloor heat zones ensure the house is always at a perfect temperature throughout. Working at home is a pleasure with a 900Mbps fibre internet connection for the wired and state of the art Wi-Fi network. There is nothing to worry about with a managed support and maintenance contract covering all the technology from Cyberhomes in nearby Thame who can remotely diagnose and carry out maintenance. Conifers is approached via electric gates opening out to a large graveled area which can accommodate several cars. To one side of the house the lawned garden wraps around the rear of the property, whilst boundaries edged by mature hedges and trees make the house largely private. To the front left of the house, a raised, walled border planted with mature shrubs adds extra interest. A timber summerhouse to the side of the garden has mains, electricity and water supplied.